It’s finally summer, so it’s time to hop on a bike and riding around your neighborhood. One of the quickest (and cheapest) ways you can do this is to buy one of the many low-maintenance bikes you can find online for super cheap. There are a bunch to choose from, but we’ve decided to focus on two in particular that use belt drives—an extra durable component that replaces the standard metal chain and lasts much longer. The first bike we looked at is the Ikea Sladda. It costs $499 and comes with a nice wide frame with good balance and is made to fit the largest number of people possible. The bike comes flat-packed and ships with a set of instructions that are (predictably) confusing. It reminds me a lot of the New York Citi Bike and operates in practically the same way. The second is the Priority Bicycles Classic Plus. It costs $449 and comes with a much thinner, lighter frame. It has kind of an old-timey look and an excellent turning radius that makes it really easy to control. 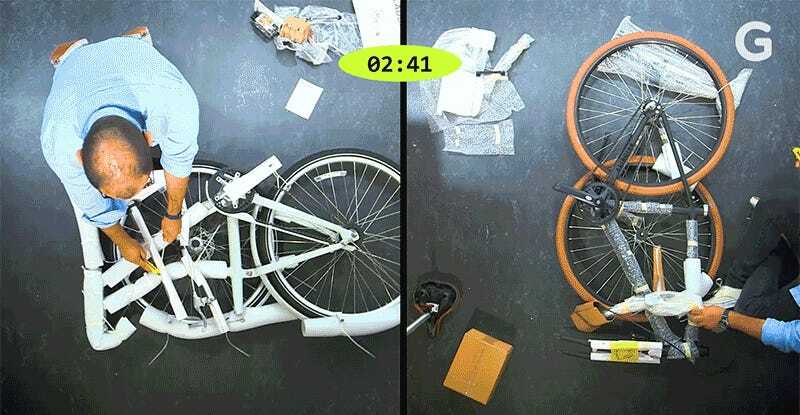 The bike comes with just a few loose parts and videos that walk users through exactly how to build it. The Sladda comes with nine parts total: mudguard, front tire, handlebars, two pedals, seat, front reflector, and rear reflector. The instructions don’t have any words—in typical Ikea fashion—so you’ll probably have to spend a few minutes looking closely at different sections to make sure everything’s lined up right. I managed to put the handlebars on backwards even after double- and triple-checking my work. The Priority Classic Plus is much easier to build and takes about half the time to assemble. It ships with only a couple of loose parts: the handlebars, seat, front wheel and pedals. The only strange detail is that it doesn’t come with any printed instructions. Instead, customers are directed to this video that walks them through the process. It’s honestly really hard to mess up, and should be no problem for anyone who’s ever held a wrench. Alright, so after we built our bikes, it was time to take them for a spin. I took both out for a ride over the Manhattan Bridge on a 8.5-mile trip home. It’s a route I’ve taken on several different bikes now and has become the easiest way to stress test the bike uphill, downhill, and at (practically) max speed. The Ikea Sladda performs extremely well on flat ground. I was surprised by how fast I could get the bike moving, and the automatically shifting gears didn’t bug me so much while I was casually rolling down the street. Going uphill is an entirely different story. The pedals jump into a lower gear when they feel more resistance, and it can be jolting when you’re climbing a massive incline. The awkwardness of the auto-shifting gears was the biggest pain point for me. I wouldn’t recommend the Sladda for city riding because it’s a little wider than most other bikes on the street, and it’s also much heavier. In tight situations, I could easily imagine the Sladda being hard to control. The Priority Classic Plus is much easier to control because it’s significantly lighter (25 pounds vs. 33 pounds), has a much tighter turning radius, and has a standard handlebar shifter that gives you more control over the gear you’re in. Side by side, my friends and colleagues have all been surprised by how much lighter the Classic Plus is and how much easier it is to ride. In this case, it’s a no-brainer. The Priority Classic Plus is not only easier to build, lighter, and more fun to ride than the Ikea Sladda—it’s also cheaper by $50.